BANDSMENS JOURNAL GIVES PRAISE TO NEWTON’S WORK. ‘We would remind our Irish friends that the entries for the Dublin Feis Ceoil Brass Band Competition does not close till March 13th. The test piece chosen is ‘Beauties of Wagner’ Newton No 2 from the Champion Journal and it really is a magnigicent test piece, in spite of his years Mr Newton is still hard at work arranging and composing music to the delight of the ears of the people’. In connection with the Silsden Cricket Club and Brass Band a Gala was held on Saturday last. When the following events took place Brassey playing, Throwing and other events were cancelled through insufficient entries. Dancing was indulged in after 6 o’clock. The Cricket club and Silsden brass Band organised a very successful Gala last Saturday. Considering the inclement weather that prevailed in the early part of the day some events were put off due to the showers. The band played for the dancing and a good number of people availed themselves of the opportunity of passing an enjoyable evening. The Silsden Brass Band held a social and dance in the town hall on Saturday last. The room was well filled. Steeton Cricket Club organised a sporting event on its cricket field. The main event was the ten mile walking race. These were very popular events at that time. The race took the competitors through Eastburn, Sutton, Cross Hills, Farnhill, Kildwick and Silsden before returning to Steeton. Whilst the walkers were taking part in the race, Silsden Band entertained the spectators at the field whilst the shorter events were taking place on the cricket field track. Keighley News 5th March 1904. The public evinced a praise worthy interest the object for which a concert was held on Tuesday evening in the Silsden Primitive Methodist School Room and assembled in large numbers despite the winter weather out in the streets. The concert was arranged by the members of the Silsden Brass Band with the aim of benefitting one of their members Mr William newton who with his wife has been ill for several months, and has spent a considerable time in the local infirmaries. The couple are advancing in years. Over £20 was raised. Keighley News April 9th 1904. The bands services were in regular demand for local Civic Duties and one such event was to lead the procession of local dignitaries and the Fire Brigade to the opening of the newly built Silsden gas works. Keighley News May 7th 1904. The new gas works situated on the east side of the town close to the Leeds Liverpool Canal which will form a ready means of transit for the coal required for gas making. A procession was formed with members of the Council: the Fire Brigade had the Yorkshire District Challenge Shield of which they are at present holders and a cup won last year displayed on their horse cart. The Silsden Brass Band played selections. Keighley News June 18th 1904. Mr William Newton (62 years) the oldest member of the Silsden Brass Band for which he had performed for over forty years has died. He was one of the number of Silsden Bandsmen who formerly played in the Militia Band of the Lancaster Regiment, during their training period at Lancaster. The band played ‘Lead Kindly Light’ to the tune of Sandon at his graveside. This event held on July 2nd 1904 was organised by the Silsden Cricket Club and the Silsden Brass Band and took place on the cricket field. As well as the Silsden Ambulance Brigade, Brigades from other villages and towns took part, some representing the factories where they were employed. The competition involved them using their medical skills. Other events were also organised for the general public, these included tug of war; skipping; throwing at wicket; and brassey. For its part Silsden Brass Band provided the music for the evening dancing. Keighley News August 13th 1904. A sacred concert was held on Sunday in the Greystones Field lent by Mr J W Shuttleworth in aid of the Silsden Nursing Association. The music was provided by the Silsden Brass Band who gave creditable expositions of items from Handle, Cowen and E Newton. The latter a well-known local composer and musical arranger. The amount raised was £4. Over many years the Silsden band gave concerts in support of local medical services at Victoria Hospital at Keighley and others further afield such as Bradford Eye and Ear Hospital and Leeds General Infirmary. The National Health Service did not exist at this time and charitable events were very important for the hospitals to receive much needed finances. The scholars and supporters of the Silsden parish Church Sunday School had ideal summer weather on Monday for their annual procession and gala. The school authorities still cling to the ‘Feast’ Monday for this event, despite the fact that the village is largely depleted by the ever growing numbers of those who spend their holidays on the coast and inland pleasure resorts. The afternoon proceedings commenced by a short service in the church conducted by the vicar the Rev J Berry. At its conclusion the company headed by the Silsden Brass Band and the School Banner commenced their peregrination of the village. The first stop for singing was at the junction of Skipton Road and Tufton Street and other places visited were Bolton Road, Canal Bridge and the Becks. The singing was accompanied by the Brass Band under the baton of Mr J L Vickers. Teas was then served in the school room and in the evening sports and dancing was held in a field near Keighley Road, kindly lent by Mr G Taylor. Other churches and organisations held their own annual gatherings in the village. The Silsden Brass Band often supported these groups by providing the musical accompaniment. Keighley News December 3rd 1904. After a cessation for several years from concert promoting, the Silsden Brass Band with the object of supplementing a fund for providing new uniforms held a concert at the Church School on Saturday night before a fair audience. The Albert Street Baptists Prize Choir from Keighley, Mr Cerus Jackson of Bradford – solo cornet of the Black Dyke Band and Mr G E Shackleton humourist of Keighley were engaged. Some disappointment was caused by the non-appearance of the cornet soloist especially to a number of brass band enthusiasts who had gathered from surrounding districts. A letter from Mr Jackson to the secretary of the band received on Monday morning stated that he was suffering from an abscess in the cheek and under those circumstances did not think it wise to appear. Memories of Meeting the Famous English Poet, Wordsworth. Death of Well Known Silsden Sportsman. The death took place on Wednesday morning at the age of 85 years of Mr Thomas Spencer “Owd Tommy” as he was familiarly called, was the oldest man in Silsden and had many interesting experiences. From his youth he was always an enthusiastic sportman and probably followed the hounds on foot for hundreds of miles in all. He was usually to be seen up to a year ago at the local ‘meets’ of the Craven Harriers, and he often followed the Otter Hounds in Wharfedale, Lunedale and in the Lake District. In his early life he was in temporary charge of a pack of hounds in the Yorkshire Dales, and it is related that on one occasion he turned up at Silsden with about a score of the dogs and kept them in his own home all night. He was a member of the Silsden Old Brass Band, acting as drummer, and he had a habit of performing various feats with his drumstick, one of which was to throw the stick into the air and catch it again without losing the connection of the musical time. On one occasion the band took part in and won a contest at Manningham, and Mr Spencer beat with such vigour as to burst the drum just as the test piece concluded. In his early days he walked from Silsden to Morecambe and he went on to tell how this popular Lancashire pleasure resort of today was then only a village with two Inns and a few houses. On another occasion he was one of a few of the Old Silsden Brass Band who went busking in the Lake District, when half a day was spent with the poet Wordsworth. It may be mentioned that Tuesday last was the 57th anniversary of the death of Wordsworth. Thus the date of the visit of Silsden Old Band must be sixty or more years ago. Once at least in his long life Mr Spencer has had a narrow escape from death. He was sitting at this fire-side during a thunder storm with a dog lying between his knees when the lightning struck the chimney killing the dog and throwing Mr Spencer some distance. The brass band took part in the Steeton Cricket Club Gala and performed the music for the dance selections. The band provided music at the Fete and Gala organised by Silsden Cricket Club and the band. Keighley Gala with the Leeds Military Band, Marriner’s Band, Kildwick and Silsden Brass Bands who all occupied stands at different times in the afternoon. Sunday School Treat at st James’s Parish church where Silsden Brass Band provided the music and led the procession to the field but after a short distance the procession was abandoned due to a heavy storm. The weather eventually improved and the field activities could continue. The band took part in the Cooperative Festival at Silsden where 800 children took part in activities on the cricket field. The band provided the music at the Football Gala and Sports and music for the dancing in the evening. Keighley News February 8th 1908. The Silsden Brass Band were responsible for the presentation of an excellent concert in the Primitive Methodist School-room on Saturday evening. There was a good audience. In point of quantity and quality the programme provided an abundance of good things, the hour being considerably enjoyed before the concert closed. One of the principal attractions was Miss Florrie Horsfield of Baildon, a solo cornetist of tender years and a pupil of Mr John Paley. This little artiste created an excellent impression by her clever manipulation of her instrument and she was enthusiastically recalled. The Glee Union under the baton of Mr J B Summerscales delighted the audience with a number of Glees and part songs. A couple of selections ‘Songs of Balfe’ and ’11 Traviatore’ were also given by the band under the conductorship of Mr J L Vickers. The proceeds were for the band fund. Keighley News 20th June. The band played at a benefit gala and sports at Silsden Cricket Field. KEIGHLEY HOSPITAL GALA – THE ATTRACTIONS IN THE PARK. The entertainments in the park were suited to a variety of tastes. High class music was discoursed from some of the band stands, notably that occupied by the band of the local Territorials, while dancing on the fresh turf was catered for by the Cowling, Silsden and Kildwick Bands. SILSDENS FIRST CARNIVAL. At the inaugural of Silsdens Carnival both Silsden and Addingham Brass Bands took part in the proceedings. Silsden Brass Band leads the procession at that is believed to be the town’s first gala, in 1908. The event was called Silsden charity Carnival (it became a gala after the Second World War) and was held to raise money for the Helping Hands Fund for relief of poor people. The procession is shown passing the Red Lion. At the Silsden Co-operative Childrens Demonstration the Silsden Brass Band and the Colne Morris Dancers took part with the band playing for the dance music in the evening. Open Air Party. An open air party was supported by the Silsden Brass Band in aid of the renovation of the Primitive Methodist Chapel and was held in a field near Skipton Road. HOSPITAL CONCERT. 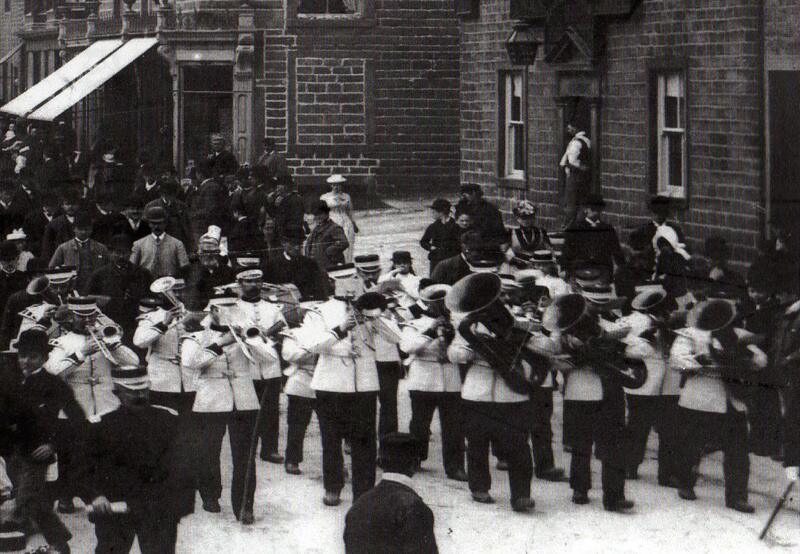 The Silsden Brass Band had arranged an open air hospital concert for Sunday afternoon, but after playing through the streets the band had abandoned the remainder of their concert owing to the unfavourable weather. Some compensation for the disappointment was obtained by a collection taken at the P.S.A. Brotherhood meeting for the bands funds which realised £4..4s..0d. SILSDEN BRASS AND REED BAND – 1908. A dance promoted by Silsden Brass and Reed Band was held in the town hall on Saturday evening. The band provided music and Messrs J H Throup and J H Brown acted as Masters of Ceremonies. About £1 was realised for the band’s new instrument fund. There were about a hundred persons present. A dance promoted by the Silsden Association Football Club was held in the town hall on Saturday evening. There was a large attendance and the music was played by the Silsden Brass and Reed Band. A dance promoted by Silsden Brass and Reed Band was held in the Co-operative hall on Saturday evening. Music was provided by the band for a fair company. The Masters of Ceremony were Messrs J H Throup and J H Brown. The proceeds were for new instruments. It is to be noted that during this year, in OCTOBER, the name of the band changed to Silsden Brass and Reed Band, this would probably give a variety to the type of music and be more suited to dancing, and seems to have been used only on occasions where dance music was provided. Brass and Reed Bands were compiled of a variety of instruments made up of Brass, Reed and Percussion. The Silsden Brass Band gave a concert in a field near Keighley Road, kindly lent by Mr Percy Bairstow, on Sunday afternoon. The band which was conducted by Mr J L Vickers credibly gave a selection of pieces comprising several pleasing items by Mr E Newton and an arrangement by Mr Newton of ‘Webbers Mass in C’. There was also a selection from ‘Trovater’, ‘The Hallelujah Chorus (Handle)’ and a cornet solo ‘Sweet Spirit (Wallace)’. The soloist being Mr Ernest Clarkson. There was a good company present to hear the band and a collection that was made for the band instrument fund realised about £3. Ilkley Gazette May 29th 1914. Death of Noted Musician. Mr. Edward Newton a well known musician died at his residence Brow Field Terrace Silsden on Wednesday aged 74. The deceased gentleman was well known to the older generation of Ilkleyites for he came to Ilkley frequently as conductor of Silsden Brass Band, and also during the years Mr. R. smith the well known music publisher used to visit the Troutbeck Hydro. Mr. Newton was a native of Silsden and in early life began to take an interest in music. It was whilst engaged at his first place of employment that he was seized with a strong desire to become a musician. In 1860 he accepted an invitation to join the band of the Lancashire Regiment and during that period he began to compose music. Six years later he was made Band Sergeant and subsequently was appointed Bandmaster of the Royal Lancashire Militia. About 1872 a new band was formed at Silsden and to this band, composed mostly of young men, Mr. Newton devoted most of his energies. He was presented by the band with a gold watch and chain as a mark of their esteem. Up to 1891 he had contributed to Mr. Smith’s (Champions Journal) alone by way of compositions and arrangements nearly 400 pieces including 137 quick marches, besides having written many hymns and anthems that have attained considerable popularity. During the years of the Queens Jubilee (Victoria) he composed the music of the song ‘For Fifty Years The Light Hath Beamed’, two copies of which were accepted by the Queen and his song ‘Old England’s Mine Forever’ has been sung by many celebrated vocalists. In one of Newton’s quick marches he introduced one of Lady Arthur Hills popular songs ‘In The Gloaming’. He was conductor of the Keighley Volunteer Band and for seven years he conducted the annual performance of the Messiah at Silsden. He had trained five bands for contests, had attended fourteen contests and succeeded in winning ten prizes. He had also officiated as judge at several contests. Keighley News May 30th 1914. By the death of Mr. Edward Newton of Brow Field Terrace, Silsden, the country has lost one of its talented musicians. Mr. Newton who had reached the age of 75 years had been in failing health for some time and the end came peacefully early on Wednesday morning last. He was a native of Silsden which has long been noted for its musical enthusiasts, a band having existed there nearly a century ago, its members including Mr. Newton’s father and two uncles, all of whom left good names behind them. In later years several Silsden musicians were connected with travelling menageries among them being Messrs Wilson, Bottomley, Fortune, Driver and Longbottom. Brass bands frequently accompanied menageries in those days and Mr. William Wilson was for many years the leader of Edward’s (late Wombwell’s) Royal Windsor Castle Menagerie Band, and the name of Wilson is still familiar in brass band circles. Early in life Mr. Newton began to take an interest in music, and this was doubtless due to the fact that while engaged at his first place of employment he came in close touch with one or two members of the Silsden brass band who were employed at the same place. When the Crimean was broke out most of the members of the Silsden band along with other musicians engaged with the officers of the 1st Lancashire Militia to become the band of the regiment, Lancaster being the headquarters. 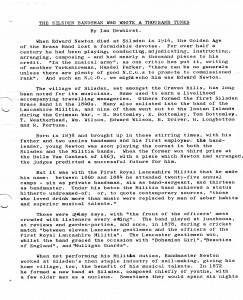 The bandsmen proceeded to that place and were enlisted and when peace was declared the regiment returned to Lancaster and soon afterwards some of the Silsden bandsmen came home, settled down and formed a band. Mr. Newton was one of the first members of that band. In April 1860 he accepted an invitation to join the band of the Lancashire regiment and it was during Mr. Newton’s early association with this band that he began to compose music. The late Mr. Dowling was then Bandmaster. He had been out with the regiment to the Ionian Islands and was more like a country parson than a regimental bandmaster. His successor was Mr. George O’Brien a very clever and talented musician, and after the annual training the Silsden band decided to engage Mr. O’Brien to train them for contest work and they subsequently won the 1st prize at Keighley and 3rd prize at Belle Vue in 1863. 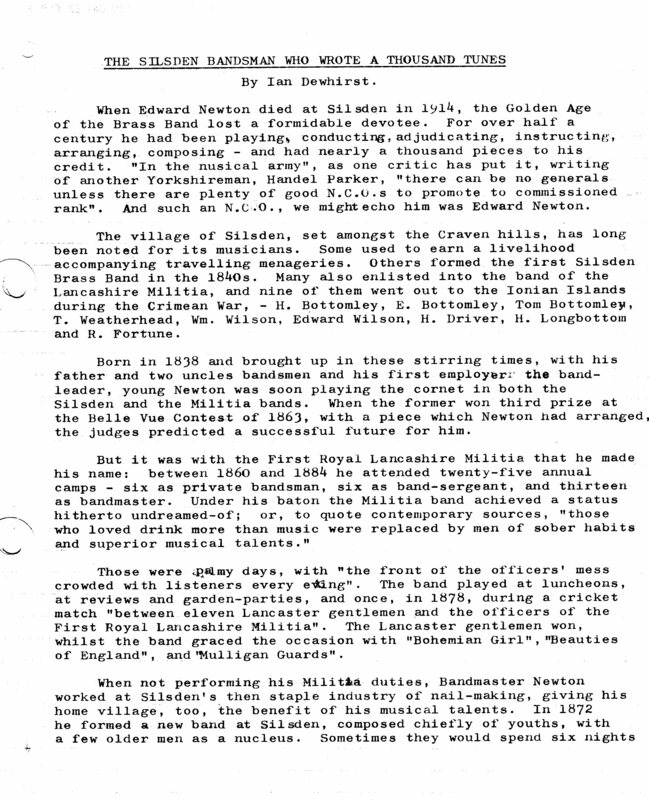 Mr. Newton had arranged the Silsden bands piece for Belle Vue and after the bands had played Mr. M. J. Riviere one of the judges went to the Silslden band and inquired where they had obtained the piece. Mr. Thomas Weatherhead the band’s secretary informed him that Mr. Newton had arranged it, whereupon Mr. Riviere predicted a successful future for him. 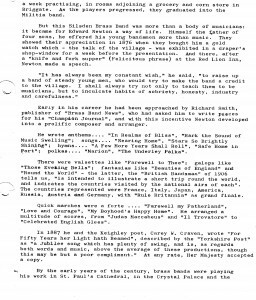 Mr. R. smith, a gentleman who was always on the lookout for musical talent heard of Mr. Newton and finding in his compositions evidence of originality asked him to write pieces for him. He did, and later Mr. Smith offered him an annual retaining fee agreeing to pay in addition for all scores made use of by him. At this time Mr. Newton was working at his trade as a nail maker, then the staple industry of Silsden and it was with diffidence that Mr. Newton accepted the offer. Subsequent experience however proved the accuracy of Mr. Smith’s judgment, and the result was that Mr. Smith increased the retaining fee by one half the original sum and doubled the price paid for the scores. In 1866 Mr. Newton was made band sergeant and according to the records of the 1st Royal Lancashire Militia he was appointed Bandmaster of the regiment in 1872. His first work on being appointed was to weed out all the indifferent material and those who loved drink more than the music were replaced by men of sober habits and superior musical talents. A wonderful change was effected in a very short time and in place of the remark ‘it’s only the Militia band’ the front of the officers mess was crowded with listeners every evening, and on special occasions thousands of people assembled to hear the performances of the band. In recognition of Mr. Newton’s service the officers of the regiment presented him with a gold-mounted ivory baton. The Hon. 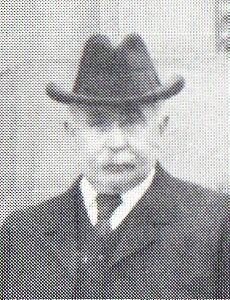 F. A. Stanley was then in command, Colonel Clifton having resigned through failing health and old age. At a private interview with Mr. Newton. Colonel Stanley who was then Secretary to the Treasury and afterwards Secretary for War, personally complimented him on the result of his labours. 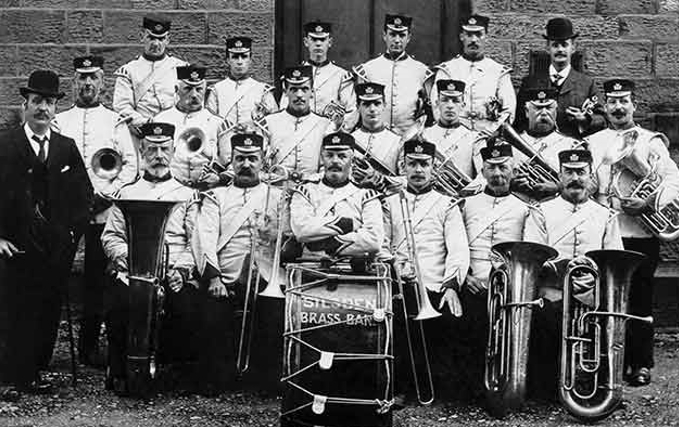 About 1872 a new band was formed at Silsden composed chiefly of youths from 15 – 16. Three or four members of the former band forming the nucleus. Mr. Newton bestowed his energy on this band, often devoting six nights a week to their instruction. As each member became sufficiently competent he was drafted into the regimental band which assembled at Lancaster at the time of the annual training. In 1876 the Silsden brass band presented Mr. Newton with a gold English Lever Watch and a gold Albert Locket as a mark of their esteem. From 1874 to 1883 the band of the regiment kept in good form and complimentary notices of its performances often appeared in the local press. In 1883 the inhabitants of Lancaster determined to show their appreciation of the performances of the band, invited the members to a supper and in the speeches which followed the supper Mr. Newton was highly complimented. In 1882 the regiment was ordered to do garrison duty at Fulwood Barracks, Preston and on its return to Lancaster Colonel Stanley, then Lord Stanley of Preston and Governor General of Canada sent for Mr. Newton to the front of the regiment, shook hands with him and bade him farewell. As a parting gift from the members of the band Mr. Newton attended twenty five consecutive yearly trainings with his regiment. Six as private bandsmen, six as band sergeant, and thirteen as bandmaster. Mr. Newton had up to 1891 contributed to Mr. R. Smith’s ‘champion journal’ alone by way of compositions and arrangements nearly four hundred pieces, including 137 quick marches, besides having written many hymns and anthems that had attained considerable popularity amongst which may be mentioned ‘In Realms of Bliss’ ‘Salam’s Plains’ ‘A Few More Years Shall Roll’ and ‘Safe Home in Port’. In the Queen’s jubilee year Mr. Newton composed the music to the song ‘For Fifty Years Her Light Hath Beamed’ and two copies of the music were accepted by the Queen and his song ‘Old England’s Mine Forever’ has been sung by many celebrated vocalists. 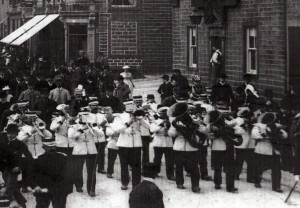 In one of Mr. Newton’s quick marches he introduced The Lady Arthur Hill’s popular song ‘In the Gloaming’ permission to use this song in his march ‘for publication’ being obtained through the influence of the Countess of Bective who when the Silsden band sometime afterwards visited Kirby Lonsdale to play at the flower show requested the band to play the march. At the Countess’s request Mr. Newton sent her a set of the parts for full military band as she desired to send the march to the Princess Louise who was then in Canada. Lady Bective permitted Mr. Newton to dedicate his composition the ‘The Underley Polka’ to her. Mr. Newton conducted the annual performance of the Messiah at Silsden for seven years. He had trained five bands for contests, had attended fourteen contests, and succeeded in winning ten prizes, and had also officiated as judge on several occasions. He was also for some time conductor to the Keighley Volunteer Band. He was a self made man and often received letters of congratulation -which he greatly prized – upon the pieces he had composed. Some time ago Mr. Newton was honoured at the Silsden Primitive Methodist Church, where he had been a member for a large number of years, by a special programme wholly composed of his own compositions. The Rev. Jacob Walton who was the preacher on that occasion remarked that Mr. Newton had been a conspicuous figure in the musical world for many years, and the service was a fitting tribute to his work. There were few places in the land that could boast such a talented musician. He had composed over 400 pieces and that number did not include all he had given to the world. Hymns and anthems had been amongst his favourites, and he had enriched the music of the church in no small way. The tune to the opening hymn ‘Salam’s Plains’ had been composed forty years ago when Mr. Newton was quite a young man. Mr. Newton was in London some years later and while passing through the streets heard a Salvation Army Officer whistling the tune. He ventured to ask the officer where he had heard the tune ‘Heard it’ said the man ‘It is sung by all our people in London’. Mr. Newton told the officer he was the composer of it whereupon the man put his hand on his shoulder remarking ‘God’s blessing rest upon that tune’. Mr. Newton leaves a widow and four sons. One of the sons Mr. Arthur Newton is Choirmaster at the Silsden Methodist Church. The funeral took place at the Silsden Cemetery yesterday afternoon and was witnessed by large crowds. The cortege from the home to the Silsden Methodist Chapel was headed by the Silsden Brass Band of which Mr. Newton was formally conductor and the service at the chapel was conducted by the Rev. William Dickinson and Mr. Tom Fletcher. As the cortege entered the chapel the organist Mr. Bernard Longbottom played the Dead March in ‘Saul’ and on leaving ‘O Rest In The Lord’. The choir was in attendance and sang the hymns ‘What are these Arrayed in White’ and ‘Safe Home in Port’ the tunes of which were Mr. Newton’s compositions. At the grave yard the Silsden Band under the conductorship of Mr. George Laycock played the hymn ‘A Few More Years Shall Roll’ also to Mr. Newton’s tune. The chief mourners were Mr. and Mrs. S. Naylor; Mr. and Mrs. J. W. Newton; Mr. and Mrs Arthur Newton; Mr. Harold Newton; Mr. and Mrs. George Newton; Mr. Edward Newton Jnr; Miss Annie Newton; Mr. W. K. Newton; Mr. Sam Newton (brother); Miss Sarah Newton (niece) and Mrs Sam Driver (niece). Also some former members of the band and many members of the public. 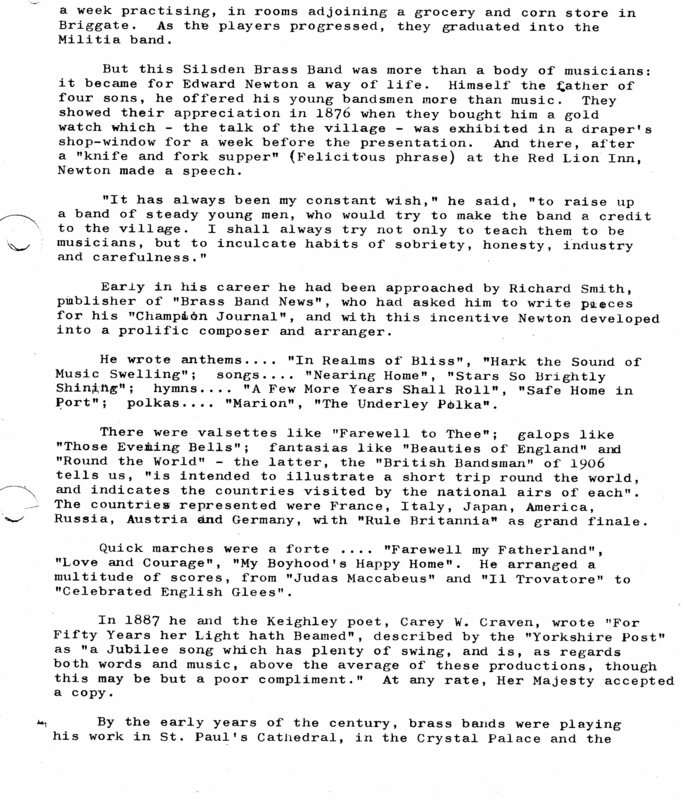 Some of The Music Composed/Arranged By Edward Newton. The Fantasia Round the World was intended to illustrate a short trip round the world and indicates the countries visited by the national airs of each. Represented were France, Italy, Japan, America, Russia, Austria and Germany with Rule Britannia appropriately for the period as grand finale. The test piece for the Dublin Brass Band Competition in 1906 was Edward Newton’s Beauties of Wagner No 2. Silsden Band Member, Casualty of World War 1. Corporal Taylor joined the colours in October of 1914, and was drafted to the front in April of the following year, since then he had had two visits home, but on the first occasion he was recalled almost immediately on reaching Silsden. He was 22 years of age, and prior to enlisting was employed as a weaver by Messrs J Walton, Airedale Shed, Silsden. He was a member of the Silsden Conservative Club, and at one time was a playing member of the Silsden Football Club. Keighley News Sept 23rd 1916. Memorial Service – At the Silsden Wesleyan Church on Sunday morning last a service was held in remembrance of corporal Fred Taylor of the West Riding Regiment nephew of Mrs Maurice Sugden, Elliot Street Silsden, who was recently killed in action in France. A large congregation included a number of the deceased relatives and members of the Silsden Brass Band of which Corporal Taylor had been a member for several years. The Rev. 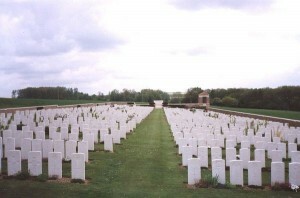 Dargue (Cross Hills)said that the facts relative to the death of Corporal Taylor had been published in the paper and were known to all present. 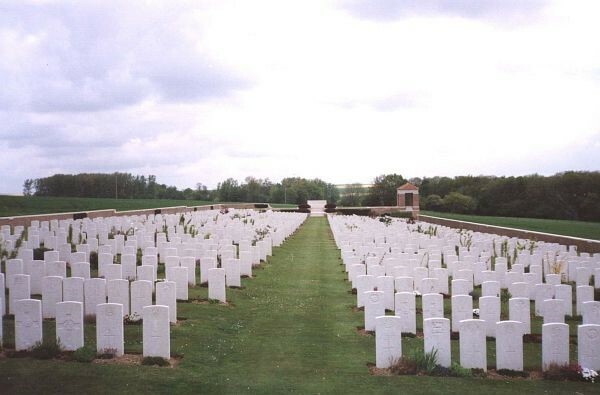 Corporal Fred Taylor is buried in the Commonwealth War Grave at LONSDALE CEMETERY, AUTHUILE, photographed below. Band’s Tribute to Fallen Member. A Service was held at the Silsden Wesleyan Church on Sunday morning in memory of the late Corporal Fred Taylor of Silsden, who was killed in action of the Western Front on 29th August. The Service was conducted by the Rev. Thomas Dargue, of Cross Hills, who, in making reference to the deceased soldier said facts had been published in the local press regarding his death and were no doubt well known by all of them. Silsden, he said, were certainly suffering its quota in the sacrifice of brave lads and men in connection with the war. That place of worship had lost Private Rhodes Spence about a year ago, and now again corporal Fred Taylor. Both deceased soldiers had had associations with the Silsden Wesleyan Sunday School, and the presence of a large gathering expressed sympathy with the friends and relatives who were left behind. He commended them with very heartfelt grief for the comfort and help of God. The Silsden Brass Band, of which Corporal Taylor was a former member for several years and a trombone player, played the hymn ‘, Holy, Holy, Holy’ from the bandroom in Skipton Road to the Wesleyan Church and during the Service they played ‘A Few More Years Shall Roll’ to the tune composed by the late Mr Edward Newton a former Silsden Bandmaster and well known musical composer. The hymns sung during the Service included ‘Oh God Our Help In Ages Past’, ‘The Son Of God Goes Forth To War A Kingly Crown To Gain’ and ‘Jerusalem The Golden’. The band struck a solemn and impressive note in the Service during the playing of that well known hymn, and their tribute to one whose happy associations they still cherish was worthy of the band’s best traditions. After the Service they played the hymn ‘Hark The Angelic Hosts Above’ from the Wesleyan Church to their rooms. 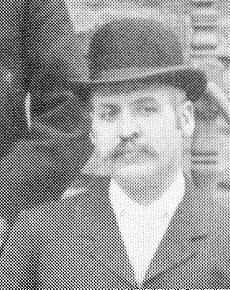 The Bandmaster was Mr George Laycock. 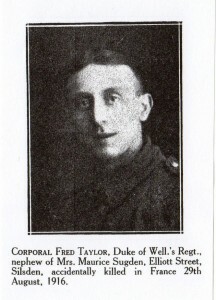 Official Details of Corporal Fred Taylor. CWGC Grave/Mem Ref:IX. H. 5.
o 1911 Silsden Census: 12, Elliott Street – Fred Taylor, aged 17 years, born Oldham, Lancashire, nephew of Maurice and Lily Sugden. Death of Private Bernard Locker. CWGC Grave/Mem Ref: Pier and Face 2 C.
Craven’s Part in the Great War Entry: PRIVATE BERNARD LOCKER, East Yorks. 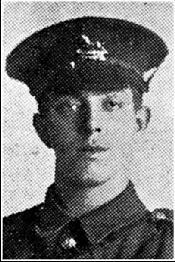 Regt., son of Mr. & Mrs. H. Locker, 27, Elliot Street, Silsden, presumed killed 7th November, 1916. Keighley news December 2nd 1916 – Page 3. Official information has been received this week that Private Bernard Locker, of the East Yorkshire Regiment and son of Mr Herbert Locker, 27 Elliot Street, Silsden has been missing since November 7th. Private Locker, who is 19 years of age enlisted about two years ago. He was in the Regimental Band attached to the West Yorkshire Regiment, but was eventually transferred to his present Regiment and went to the front about six weeks ago. Prior to joining the colours he was a member of Silsden Band, and was employed at the Steeton Bobbin Mill. He has for ten years been connected to the Silsden Primitive Methodist Sunday School. Eighteen year old Bernard Locker who was one of the band’s new faces and played the cornet, enlisted in the Army in June 1915. He was drafted into the relative safety of a Regimental Band where he served as a Bugler. In autumn 1916 he was called to the front line of the bloody campaign still raging on The Somme. Bernard would never play his bugle again. Within five weeks he was officially described as missing and subsequently presumed dead. His body was never found. He is remembered on the Thiepval Memorial in France. Keighley News 23rd May 1914. Silsden Brass Band officiated at this event and played selections of music prior to the opening ceremony. The council school which has been erected in Hothfield Street, Silsden, to take the place of Bolton Road School was formerly opened on Saturday afternoon last in the presence of a large and interested company by Sir John Horsfall Bart, chairman of the West Riding county Council. Accommodation at the new school is for 400 pupils and the total cost is over £6000, with eight classrooms provided and a spacious assembly hall. Keighley News 30th May 1914. Despite the cold and threatening weather on Saturday evening last a fairly large company attended the annual May Fete and Gala promoted by the Steeton Cricket Club and held in the cricket field. The Steeton Male Voice Glee Union who recently won the first prize at the Morecambe Festival ably sustained two long programmes under the leadership of Mr Hume Rathall: Professor Carl Everett gave a conjuring and juggling display and dance music was contributed by Silsden Brass Band. A variety of competitions took place including quoits, brassie playing and throwing at wickets. Keighley News September 5th 1914. Committee Messrs W Atkinson, Willie Whitaker, J Clarkson and Harry Roberts. Citizens War Rally at Silsden. At the outbreak of the First World War in 1914 numerous distress committees were set up throughout the country to support the war effort by raising funds for the service men. Extracts from Keighley News September 1914. In early September 1914 Silsden distress committee organised a large citizens rally to show their support and loyalty to the cause and the town was decorated with flags and streamers. Over twenty local groups and organisations came out in large numbers to support the rally and were from such associations from Local Council members to the Boys Brigade. The proceedings commenced with a procession which was formed at the Silsden Cricket Field; headed by a collecting cart bedecked with the flags of the Allied countries. The procession was led by the Silsden Brass Band and proceeded by way of the Keighley Road, through Kirkgate, to Punch Bowl Hill, where addresses were given, and vocal items rendered by the United Choirs of the town and selections played by the Silsden Brass Band. End of First World War. Keighley News November 16th 1918. Silsden Band involved in Peace Celebrations. The anxiously awaited news of the signing of the Armistice was heralded in Silsden between 11.00 and 11.50 am by the sounding of the mill buzzers, and in a very short time flags were everywhere in evidence. Most of the mills and workshops and places of business closed at noon and large crowds of people flocked into the town. The school children who had been given a holiday on account of the influenza epidemic made most of the occasion and paraded the streets waving flags and singing patriotic songs. 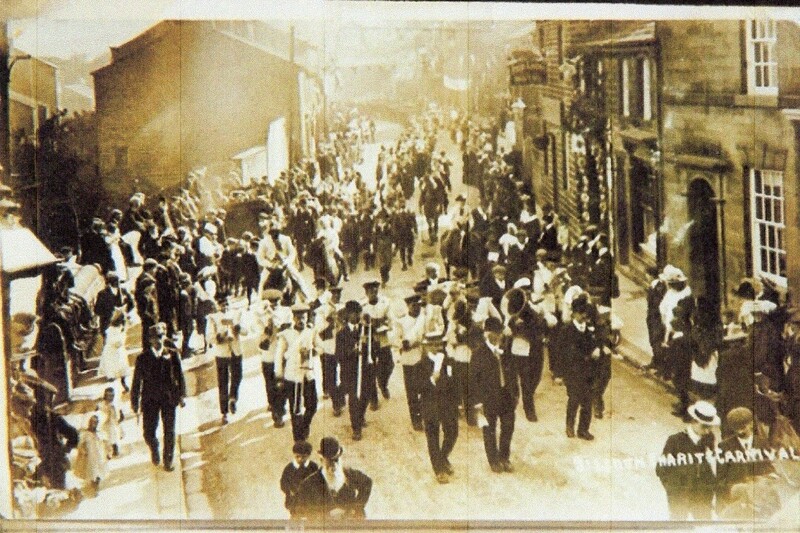 In the afternoon the Silsden Band turned out and after parading the main thoroughfare made their way to Bolton Road end where they played patriotic airs before a large crowd. The bells of the Parish Church rang out a merry peal. Keighley News March 13th 1920. DANCE AT THE TOWN HALL – There was a dance held at the Town Hall last Saturday evening where the Silsden brass Band provided the dance music. There was a large attendance and proceeds were for the new instrument fund. Keighley News May 15th 1920. BRASS BAND MEETING – A general meeting of the Silsden brass Band was held on Tuesday evening. Mr John Cowling presiding. The report and balance sheet were submitted by Mr Jim Bradley secretary and passed unanimously. The conductor Mr N Murgatroyd was heartily thanked for his untiring effort during the short time he has had the band in hand. A discussion took place as to the availability of putting the band under popular control and it was suggested that the committee should include representatives of the public of the town. It was eventually decided that the following should serve on the committee for the public. Messrs A Townson, J Baldwin, T Potter and Mr A Ward. Members of the band Messrs W Whitaker, A Roden, W Atkinson and E Craven, with Mr J Bradley as secretary, Mr N Murgatroyd was elected conductor.